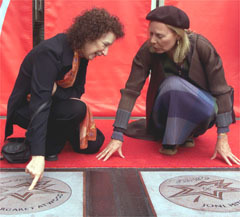 TORONTO (CP) - Margaret Atwood and Joni Mitchell have become the latest additions to the Canadian Walk of Fame, taking their places in a concrete pantheon of homegrown international stars. The novelist and the singer unveiled their monuments Friday on the King Street West sidewalk along a row of immortalized hockey players, rock stars and actors in the heart of the downtown theatre district. Mitchell, who was a 2000 inductee, couldn't attend an unveiling until now. "For my star I hope if you're crossing over it, since the world is moving so fast and has gone so mad, that you would slow down a little and think of something funny or something kind, think of someone you love," Mitchell said. "I prefer you don't spit there - curb your dog elsewhere. And just use it as a little contemplative place, sit there and have a private chuckle, and that would make me very happy, that would make it practical and useful." Accepting a granite and brass statuette that accompanies the concrete star, Atwood thanked the Walk of Fame organization. "We have a kind of running contest going on as to which award makes the best murder weapon - this wins," she quipped, gripping the hefty award. Atwood said she's pleased the organization, which has already laid 49 of the commemorative sidewalk stars, chose to recognize a fiction writer. "It's the first time that they have elected to bestow it on a novelist," she said in an interview Wednesday. "Pierre Berton is the only other writer. So I'm hoping that it will encourage them to think in the direction of writers because when you think of Canadians who get around the world, a lot of them get around the world in the form of their books." The year's inductees also included sports heroes Jean Beliveau, Kurt Browning, Ferguson Jenkins and the late Harry Jerome, Inuit artist Kenojuak Ashevak, legendary rock band the Guess Who, actor Leslie Nielsen, polka king Walter Ostanek, ballerina Veronica Tennant, opera singer Teresa Stratas, Quebec filmmaker Robert Lepage and director Ivan Reitman. "These are all people who have gone out on a limb and whose families probably all thought they were berserk," Atwood said. "The fact that we (Canada's population) are so small makes it the more remarkable that we continue to turn out people who do well in a number of different areas. "It is something for people who really are among the most entrepreneurial people there are, that is they start with nothing but their talent, whatever it may be." With customary dry humour, Atwood said she is quite content with a permanent place underfoot. "Look at it from my point of view - the parks are all used up," she said. "I'm not going to get a park when I croak. So I'll have couple of inches of cement." To qualify for a star on the walk, nominees must have been either born in Canada or have spent their formative years here, enjoyed a minimum of 10 years of success and have "a body of work recognized for its impact on our cultural heritage." Unlike the original sidewalk squares in Hollywood, the Walk of Fame plaques display not a star but a stylized maple leaf and signature of the celebrity. 1998: Bryan Adams, musician; Pierre Berton, author; John Candy, actor; Jim Carrey, actor; Glenn Gould, musician; Norman Jewison, director; Karen Kain, ballet dancer; Gordon Lightfoot, musician; Rich Little, impressionist; Anne Murray, singer; Bobby Orr, hockey player; Christopher Plummer, actor; Barbara Ann Scott, figure skater; Jacques Villeneuve, race car driver. 1999: David Cronenberg, director; Hume Cronyn, actor; Celine Dion, singer; Nancy Greene, downhill skier; Lou Jacobi, actor; Juliette, singer; Mary Pickford, actor; Maurice Richard, hockey player; Rush, musicians; Buffy Sainte-Marie, songwriter; Wayne and Shuster, comedy duo. 2000: Maureen Forrester, singer; Michael J. Fox, actor; Evelyn Hart, ballet dancer; Gordie Howe, hockey player; William Hutt, actor; Joni Mitchell, singer; Ginette Reno, singer; Jean-Paul Riopelle, painter; Royal Canadian Air Farce, comedy troupe; William Shatner, actor; Martin Short, actor; Donald Sutherland, actor; Neil Young, singer. 2001: Kenojuak Ashevak, painter/sculptor; Margaret Atwood, author; Jean Beliveau, hockey player; Kurt Browning, figure skater; the Guess Who, musicians; Ferguson Jenkins, baseball player; Harry Winston Jerome, sprinter; Robert Lepage, film director/playwright; Walter Ostanek, polka king; Leslie Nielsen, actor; Ivan Reitman, producer/director; Teresa Stratas, opera soprano; Veronica Tennant, ballet dancer. This article has been viewed 7,279 times since being added on October 20, 2001.